Where restaurants have the Michelin stars and the film industry the Oscars, the IP industry has Managing IP Global Awards. Every year, the acknowledged British analysis and news media, Managing Intellectual Property, presents awards to the IP consultancy firms around the world that have performed outstanding throughout the past year. Winning an IP Global Award and the title “IP Firm of the Year” is indeed a special achievement since only one firm per country can win this Award. 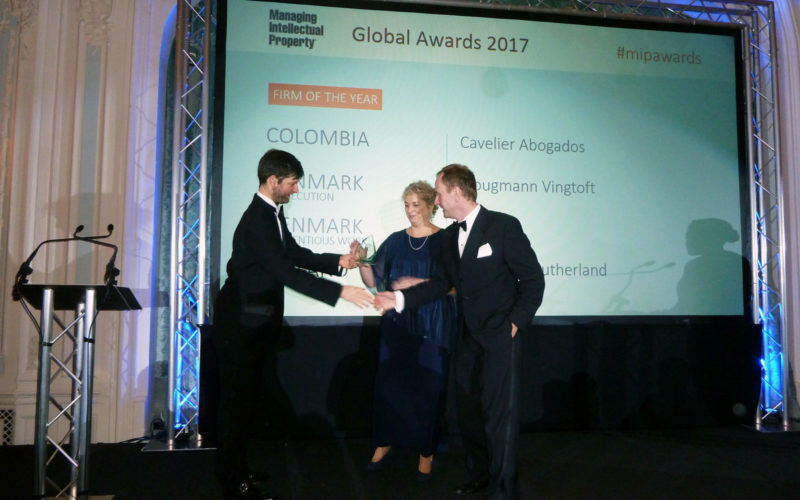 Therefore, we are extremely proud to announce that last night (9 March) we received this year’s Global IP Award as the “Denmark (Prosecution) IP Firm of the Year”. Our CEO Annette Siewert Lindgreen as well as our IP Stars patent attorneys Kim Wagner, Peter Sørensen and Michael Friis Sørensen as well as partner Katja Sørensen were present at the Global IP Awards Ceremony in London, where they received the “IP Firm of the Year” statuette. This is the 12th time that the Award has been given to the best performing company of the past year. The winner is selected on the grounds of the most comprehensive global analysis of IP firms called “World IP Survey”. The survey is based on the accomplishments and results of the firms as well as interviews with thousands of firms, IP experts and clients using the counselling of the firms. As an extra bonus, we were recently ranked in the best category, Tier 1, within Patent Prosecution for the 10th time in a row! – read more about it in this article. Can one protect Artificial Intelligence? Do you want a career at Plougmann Vingtoft?